HeatCAD and LoopCAD are now both available as the “MJ8 Edition” for the ACCA®-Approved calculation of Manual J® (8th Edition) residential heating and cooling loads. 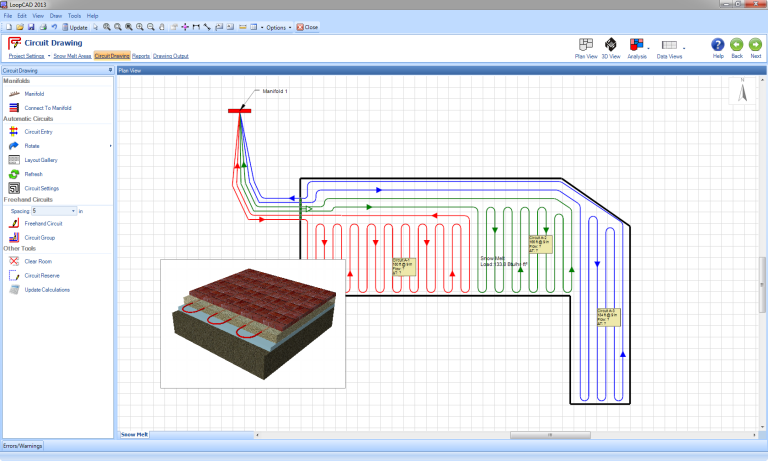 LoopCAD is the premiere software for the fast creation of professional quality circuit layout drawings for radiant heating systems. 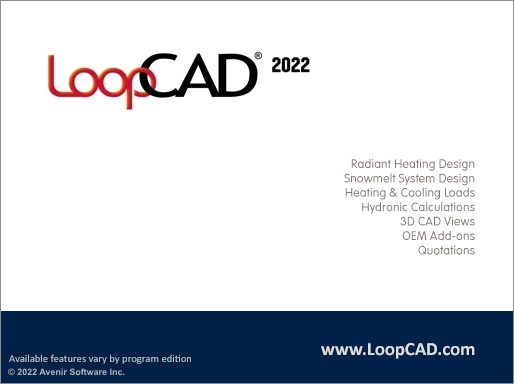 The all-new LoopCAD 2019 offers advanced design features including integrated heating and cooling load calculations, detailed hydronic calculations, snowmelt design, 3D CAD views, and compatibility with OEM design methods and materials. And now the MJ8 Edition provides ACCA®-Approved Manual J® (8th Edition) calculations for residential heating and cooling loads (more on Manual J...). 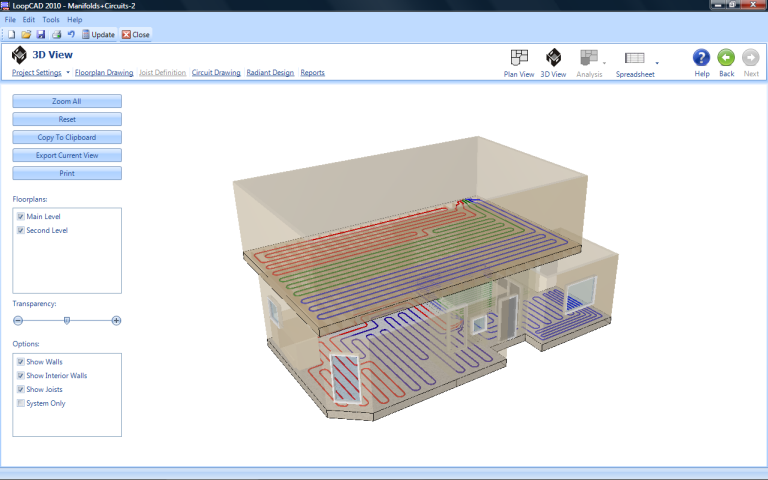 LoopCAD is the easiest, most powerful radiant heating design tool available. LoopCAD is available in three different editions to best match your needs, and the available OEM Editions work seamlessly with all three feature editions. For a list of functionality and new features in each edition, view the Feature Comparison PDF. The Video Demo provides a quick introduction, and the Tutorial lessons provide a much more in-depth look. 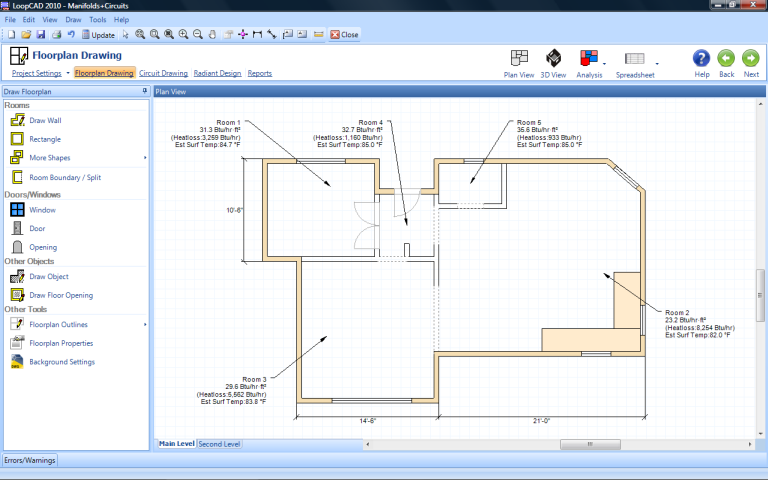 Creating floorplan drawings is very fast using the predefined rooms, doors, windows and other objects. Rooms can be resized by dragging the walls or corners, and they are easily docked together to create complex floor plans. The room shapes can be quickly edited to create very complex shapes, and you can also use the freehand drawing tools to create more complex shapes. LoopCAD also allows you to import an existing AutoCAD*, PDF** or scanned drawings to use as a template. LoopCAD automatically generates circuits for the rooms in your project. 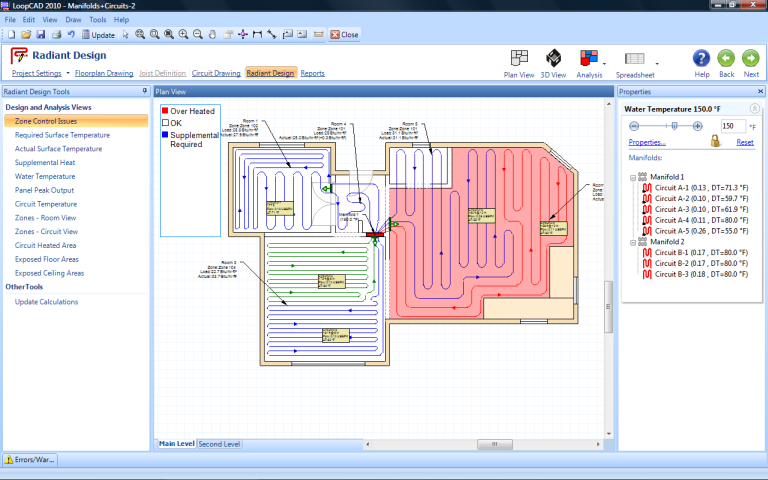 Simply drop a Circuit Entry object where you want the circuits to start, and LoopCAD takes care of the rest. It automatically designs around obstructions, like stairs, cabinets or kitchen islands. Easily edit the settings to change the pattern type, rotation, number of circuits, or tube spacing options. And use the powerful Layout Gallery tool to quickly select the best pattern for your design. For room geometries too complex for automated circuits, the freehand circuit tools let you quickly draw the exact circuits that you want. 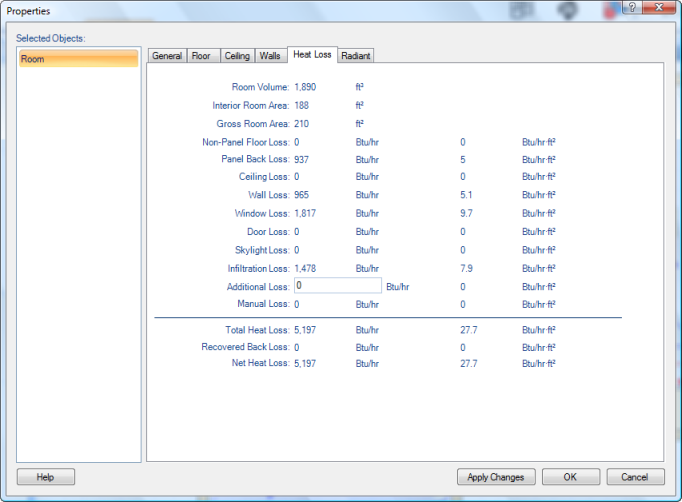 LoopCAD provides options for calculating the room-by-room heat losses automatically as you draw your floorplan. 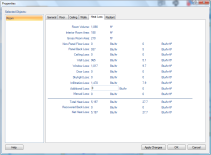 You can choose the residential calculation method that best suits your project – ASHRAE, CSA or Manual J. LoopCAD automatically detects rooms above or below, and even supports cold partition calculations between rooms. LoopCAD MJ8 is ACCA-Approved for Manual J (8th Edition) residential heating and cooling load calculations. This streamlines the acceptance of your submittals by local authorities requiring ACCA-Approved software calculations. Click here for more details. The hydronic calculations that are critical to your radiant system design are performed automatically. 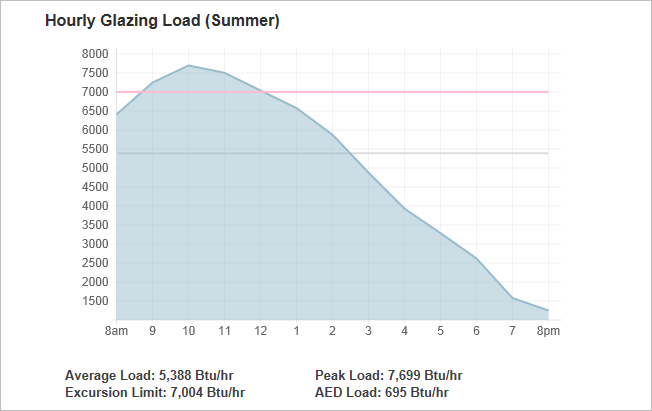 And the Radiant Design view provides an easy way to analyze and optimize your design. The Commercial Mode provides powerful new tools for designing your commercial radiant heating projects, including Custom Circuit Areas, custom construction library, and significant performance improvements. Easily divide large areas into multiple smaller Circuit Areas, making the auto-generation of circuits better and faster. Snowmelt system design is now directly supported in LoopCAD. Draw snowmelt areas, generate circuits, calculate loads and temperatures in much the same way as you do for radiant heating systems. Calculations are based on ASHRAE methods. LoopCAD generates 3D views of your building that you draw in 2D. The new 3D views are a powerful aide for ensuring accurate heat load calculations, and are also very effective for communicating your design work. Validation of the placement and sizing of windows, doors and walls is made much faster and more precise with the 3D views. LoopCAD 2019 is available in custom OEM Editions that integrate the systems and components from North America's leading manufacturers (OEMs). Not only can you design your circuit layouts, perform load calculations, and generate all hydronic data, you can also generate a complete materials list from your selected OEM. 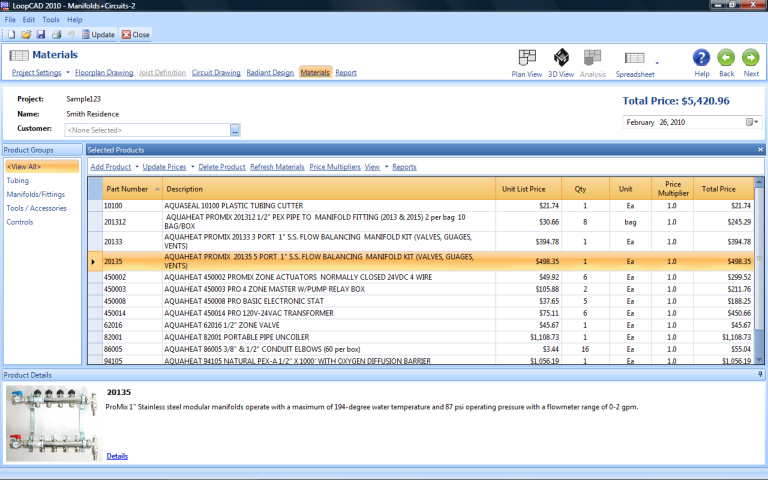 The OEM’s design recommendations and data are also built in to the OEM edition for you.